In the past two years I’ve had the awesome opportunity to compete in the Rails Rumble with a fantastic team and finish in the top 8 both years. In 2010, with our entry CommendableKids.com, we finished first in the U.S., were named a TechCrunch Top 5, a runner up from Chargify for most likely to monetize, won the appearance category, and finished fourth in the world out of 180 teams. The year before, with our entry PeepNote.com, we finished 8th out of 237 teams worldwide, and were named by Mashable as one of the “11 New Apps We Love”. Both years were a great experiences I will cherish forever and I highly recommend it to all web builders as a way to strengthen and expand your skills. This year I helped organize and judge the First Annual Tampa Mayor’s Hackathon, which was a lot of fun to be a part of as well. For this year’s Rumble, I’ve decided not to compete, but instead will participate as one of the judges. Because I’m not competing, I want to help you compete by sharing my experiences and lessons learned. Beginning tomorrow, I will publish an article every few days with tips on How to Win a Hackathon. I’ll also be speaking in Tampa on the topic at the Tampa Ruby Brigade meetup on Thursday, Sept 20th, if you are in the area and would like to attend. I plan to cover topics such as picking an idea, assembling your team, planning your deliverable, team communication, promoting and marketing your entry, handling the hackathon hours, and more. Hopefully you’ll find some helpful tips from my experiences and if you do, that will make my time competing in them even more worthwhile. After a year’s worth of tweaks and revisions, and listening to users, CommendableKids.com received an update last week! Feels so good to finally get that out. It’s been a long time coming, and it’s one of the reasons I decided to stop working on both PeepNote and We Are Tampa Bay. The feedback from parents has been very encouraging. There is still a lot more to do, but getting this update out there and having the site on a firmer foundation is exciting! Along with this update I moved the site to Heroku! As many of you know I’m a big fan of Heroku. I think its the #1 hosting platform for Ruby on Rails apps, and am so relieved to finally have every Rails app I work on now hosted on Heroku! I go into detail on the revisions over on the Commendable Kids blog. Take a look try it out! When I woke up Tuesday, I had successfully gone thirty days without eating anything dessert related, both with sugar and sugar-free. For some, this might not be as big a challenge as for others, but I had a severe love for desserts, specifically of the baked variety. I have a long standing tradition that each year, I try to accomplish some challenge by my birthday for that year. I’ve written about it previously, and for this year, I chose the thirty day sugar experiment. While it was perhaps less work than many of the other challenges, when I woke up this morning, it felt like just as big a win. You may be wondering why I called it an experiment. It wasn’t because I was experimenting to see if I could do it. Rather, I wanted to test a theory I had about dessert. We know from several studies that endorphins are released when we eat high fat and sugar foods. You can read more about endorphins online, but the big picture is that they make us feel good. Many things can cause their release, and dessert is definitely one of them. I wanted to test if it was the eating of the snack that made me feel good or it was a psychological connection between the moment at hand and the eating of the dessert that released the endorphins. In other words, would I really think sugary foods still tasted so amazing if I broke that psychological connection? If you think back to your childhood, you probably mostly ate desserts on occasions that already made you feel good, like birthdays, Christmas, Thanksgiving, Halloween, rewards for good grade or other achievements, etc. So is it possible that we are trained from childhood to associate feeling good with sugar? And, as will all drugs, we know that we eventually build up a resistance and then need more and more. I wasn’t sure if thirty days would be enough to test this, but I gave it a shot. When I began the thirty days, the first ten were the absolute hardest. Everything tempted me. But as time went on it got easier and easier and I felt less interested in the dessert. I “only” lost three pounds during that time, but I had already lost 40 pounds over the last year any way and I eat pretty clean besides the deesserts so there wasn’t as much to lose. But that was three pounds without changing a single other thing. The real test wasn’t if I would lose weight; that wasn’t even a goal. The real question was how amazingly delicious would dessert be today after not having it for thirty days. I started out with breakfast at Starbucks. 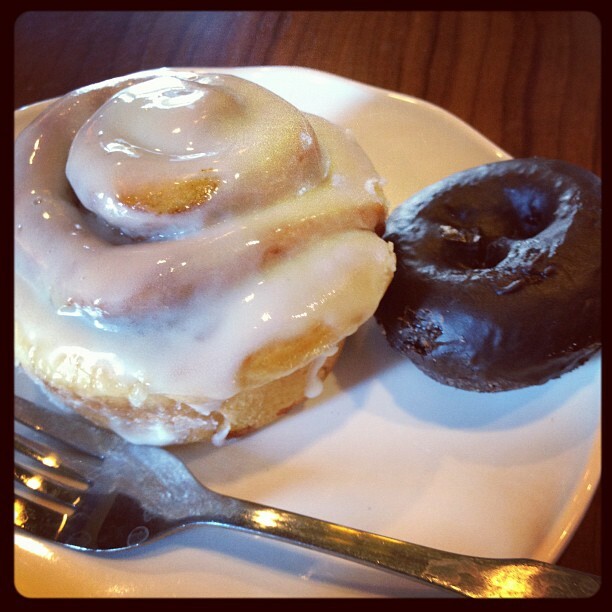 To my amazement my Starbucks released a new cinnamon roll this morning! Cinnamon rolls are one of my absolute favorites and biggest weaknesses. This one was about half the size of the one at Panera. I ordered one along with a Double Fudge donut (which, by the way is very, very small). I ate both and then followed those up with a classic coffee cake. Overboard for sure, but it had been thirty days and I deserved it! Then, in the late afternoon, I had the Hot Cookie dessert from Coldstone. I was unable to finish it, and by the time I was back to my room I was feeling buzzed and sick at my stomach from the half of it I had eaten. While that may seem like a lot of sugar, I had done that much in a day many, many times without any immediate repercussions. The biggest verdict after eating all of these? While the cinnamon roll was tasty, I honestly felt like the entire experience was very anti-climatic. It tasted slightly good, but this was what I had been anticipating for 30 days? And then to feel sick afterward…what was the point? I had really expected to have my socks knocked off by what I had been missing, but it was such a let down. It was difficult to understand why it would have ever been hard to give this up in the first place. Along the way, I also noticed that my appetite has gone way down. I don’t eat nearly as much as I used to. At this point, I don’t have an emotional pull toward desserts that I once did. I feel like in just thirty days I’ve broken through that barrier and today was able to taste the sugary substances as just what they are, without all the extra power of the endorphins I had long trained to accompany the experience. Mostly, they all just tasted like a big plate of sugar. I highly recommend trying it out yourself. I’ve been wanting to do the 21 Day Sugar Detox for a while, which is far more involved than just giving up desserts. I think I’ll start that later this month. And when I do, I’ll report back with my results. One element of the modern web development movement that has long bothered me is to see how it ignores long established software development principles. Some act as though the only way to be “modern” and use modern technologies is to throw out the old and come up with all new. While development languages might improve, and we certainly learn new things over time, I don’t believe that these important software development principles, that have been figured out over years from trial and error, even from extreme failure, suddenly become invalid because of new technology developments. The implementation of these principles may need to change, but never the underlying principle. Sadly, I would estimate that a majority of those calling themselves “developers” today don’t know the first thing about development. They have studied a language, whether it’s Rails, PHP, whatever, and they have learned it well enough to develop an average application that works. But without learning important software patterns and processes of development, all their skills with a particular language are built on a very shaky foundation. One that crumbles underneath the weight of a full size, heavily used application, and one that deteriorates over years of iterations on the same software code base. Most developers today have never maintained the same application for years and have no concern in ensuring they can. They build it to get it out the door and get it online. They get paid. They close out with the client, and they move on. I see these apps on a regular basis and I have to fix them. Sadly, it’s usually at considerable expense to the owner, often having to start from scratch because the application’s fondation was so poorly constructed. It’s far more important to understand these basic software engineering principles than it is to “master” a language. It’s great to think “outside the box”, but never just for the sake of doing it, or for the sake of being the person who came up with a great new concept. Solve problems that still exist, don’t solve problems again and again that already have a sound, established solution. Learn from others, particularly those who have more experience than you. Find out why senior developers work a certain why. Don’t assume that because they are “senior” their ways are the old, outdated ways, to be ignored and replaced. Sound principles and wisdom based on experience never lose their value.